I’d recently bought my very own snowshoes — renting gets expensive if you use them with any regularity. 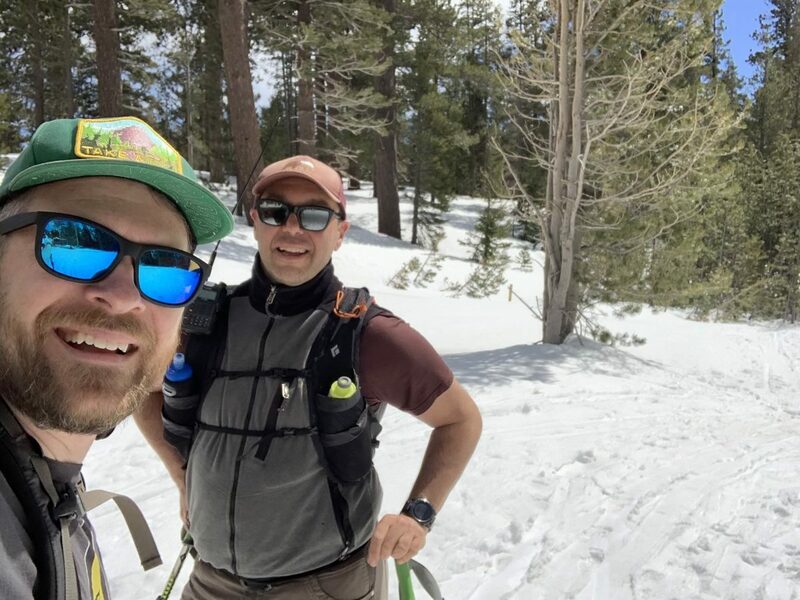 I got a really good deal on the MSR Lightning Ascent snowshoes. Since I got them on end of season clearance, time was running out to use them! 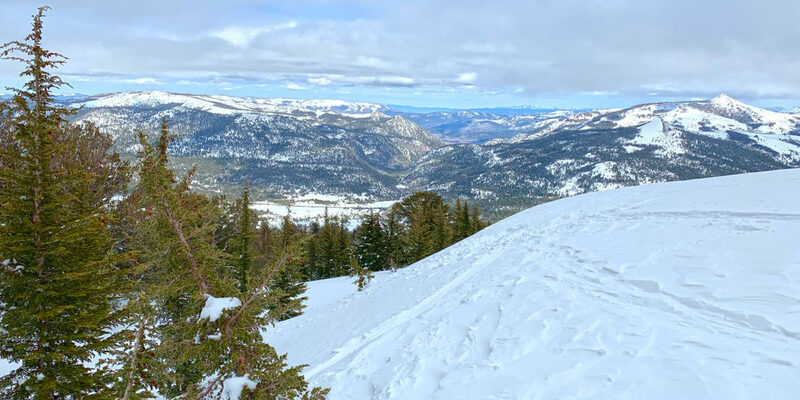 I simply had to do a trip before too much snowmelt in the Sierras. In planning this trip, I talked with Jamie N6JFD. We ended up doing it together, since he lives nearby, and even though he’s been to the top several times, he hadn’t yet activated it this year. The plan became to attend the quarterly Bay Area SOTA Breakfast, followed by driving straight up to the trailhead for Waterhouse Peak. A pretty ambitious plan, considering the drive takes about 3.5 hours each way. 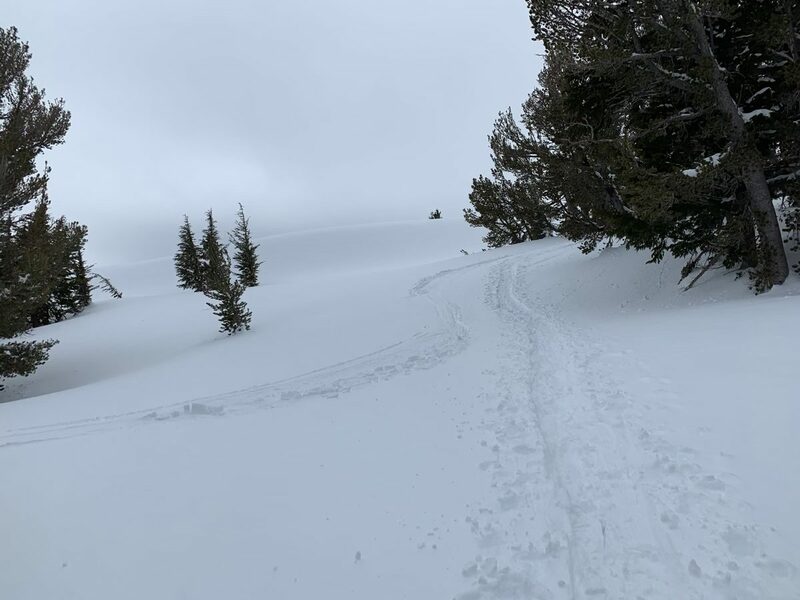 Route: Find your own route—possibly tracks to follow on the snow. After a wonderful SOTA breakfast meetup in Hayward (East Bay Area), Jamie and I briefly chatted, then hit the road with haste. The drive was fairly uneventful, other than being kind of long. 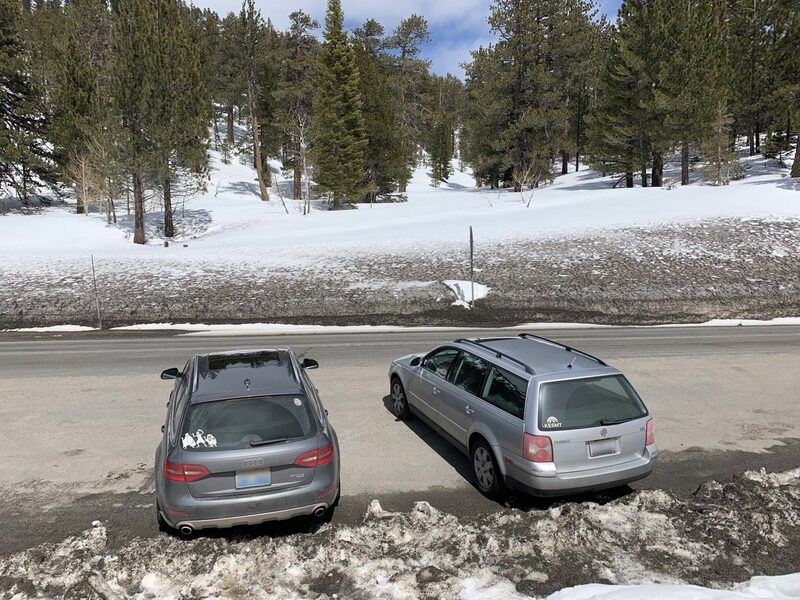 I gotta give Jamie a lot of respect, having already driven down from the Tahoe area for the breakfast, he was now driving right back up to do a summit activation with me! We made one stop for fuel and snacks. 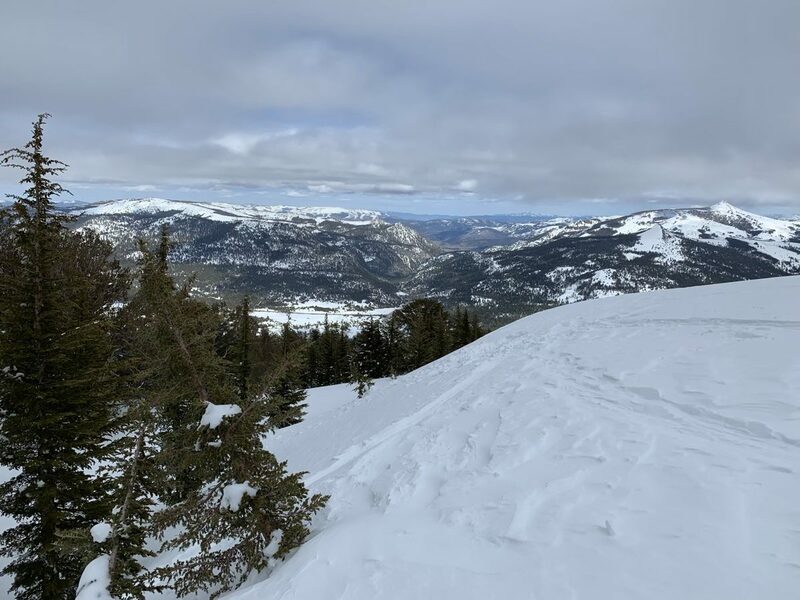 From the Bay Area, it made the most sense to connect up with Highway 88 and come in to Luther Pass from the southeast. The parking area for Waterhouse is only 2.7 miles west on Highway 89 from Pickett’s Junction. We arrived just before 2pm and were underway just after, having donned our snowshoes and appropriate clothing. I knew that even though the air temperature was fairly cool, I’d feel pretty hot going uphill in the sun. Still, I hadn’t quite perfectly planned the clothing, since I had thermals on my bottom half. To somewhat compensate for this, I wore just a cotton t-shirt for the top half. Cotton would normally be a backcountry no-no, since it holds onto moisture and makes you colder—I was counting on this. I also had a nice, dry layer or three to change into once I got to the top. The hike starts out with a gradual climb—almost level. After a couple hundred or so yards, it dips down off of a small ridge and starts the climb in earnest, up through the trees. I was sweating quite a bit, thanks to the fair conditions and sun. Also, going from sea level to high elevation tends to make things a little bit more challenging. Nonetheless, I was feeling pretty good. 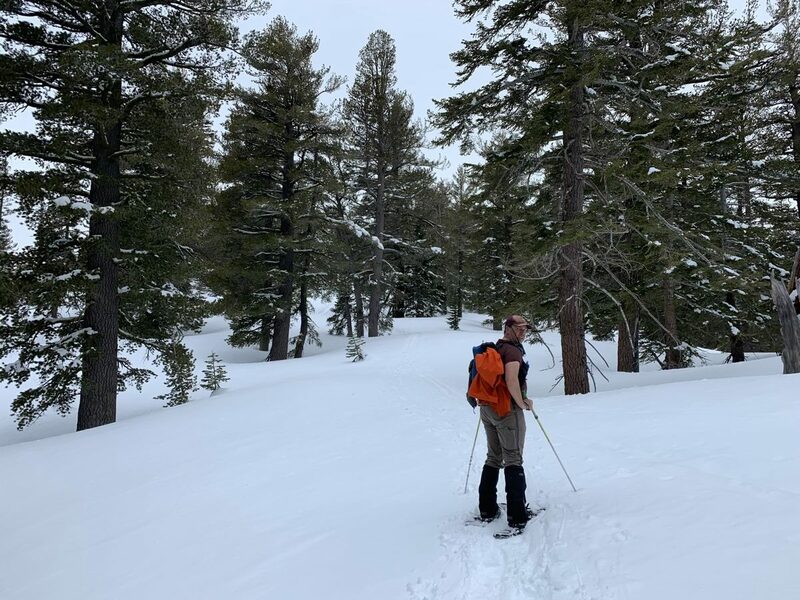 The new snowshoes are amazing—they feel like an extension of my feet due to their light weight and sturdy construction. As we climbed, the sun started to disappear. Conditions were still pretty good, but an overcast was settling in. Once we got near the top, we could see out under the overcast for quite a distance. The view to the east was especially beautiful. With a right turn near the summit, we did one final climb and we were there! Then it started lightly snowing. Lightly enough that it was almost imperceptible, but it was there. Jamie and I had previously discussed our operating plan, with him operating 30 meters and me on 20 and 40 meters. This avoids most possible interference. Having arrived at the top, we sorted out last details about specifically where we’d operate, so as to keep some distance between our antennas. I took a spot out of the wind on the north side of the summit and Jamie set up a small distance southeast of me. We both donned our down jackets. 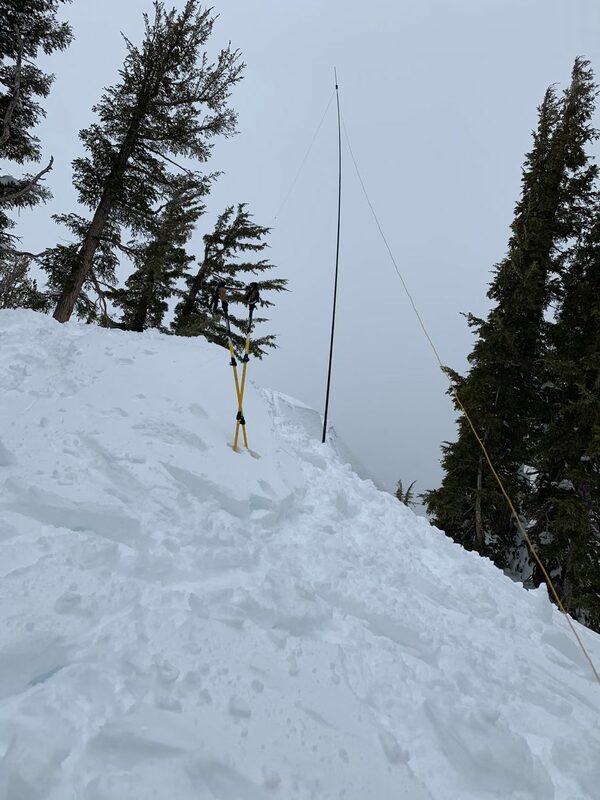 I threw my EFHW antenna wire over a tree on the west side of the summit, stuck my fishing pole mast into the snow about halfway along the wire, so as to keep the wire well above the snow, and connected it to my radio. The falling snow had become a little bit more noticeable and was a bit wet, so I got set up as quickly as I could. With the snow falling, and having gloved hands, I was a little slower than I would have liked. But before long, I was set up and operating. 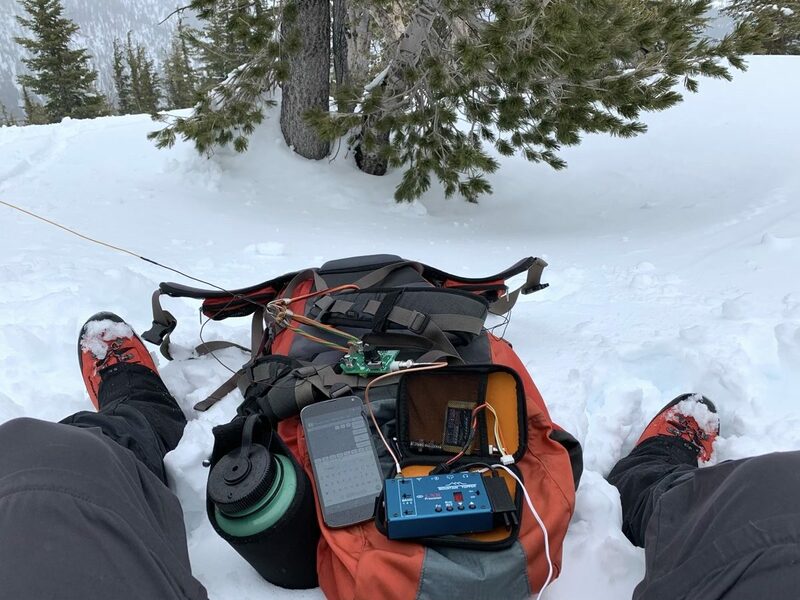 From my sitting position, I didn’t have enough of a cell signal to reliably get a spot sent out, so I just started calling CQ. I’d previously posted an alert on SOTAWatch, so expected RBNHole to do the work. I was a little concerned as to whether I’d get contacts this late in the day (it was around 4pm local time by now). It took 3-4 CQ calls and I started getting answers, including a summit-to-summit contact with Vic, AB6SO, over in the Bay Area! He was a bit weak, but we got the contact done anyway. I’m always amazed when getting these (relatively) short distance contacts on 20 meters (it’s happened before)! Having gotten all the contacts I could get on 20 meters, I switched over to 40 meters and got 5 more. 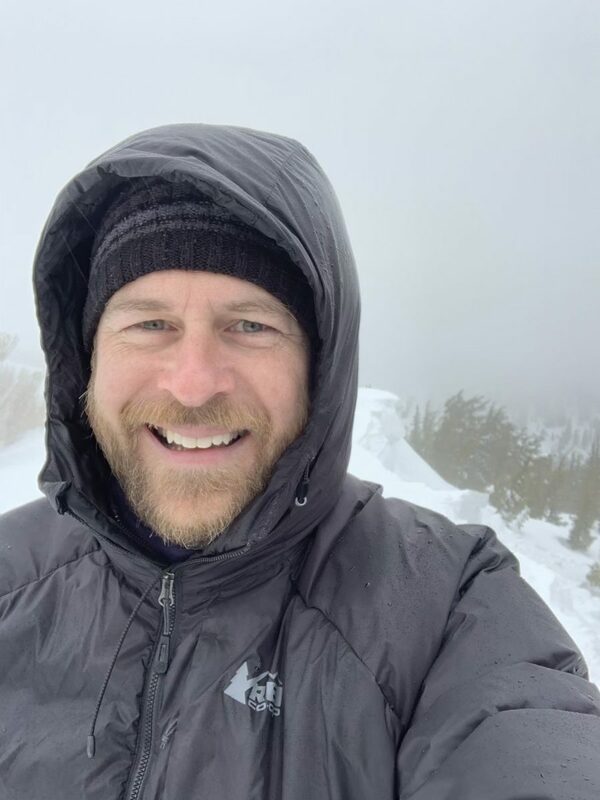 Packing up, I went up the summit a little bit to look around, and snap a quick picture of how happy I was to finally get this summit in the books! Jamie reminded me to sign the summit log before we left. Our snowshoe down took half of the time it took to go up. We stayed off the ski tracks as much as we could so they’d remain intact. Before we knew it, we were back at our cars.